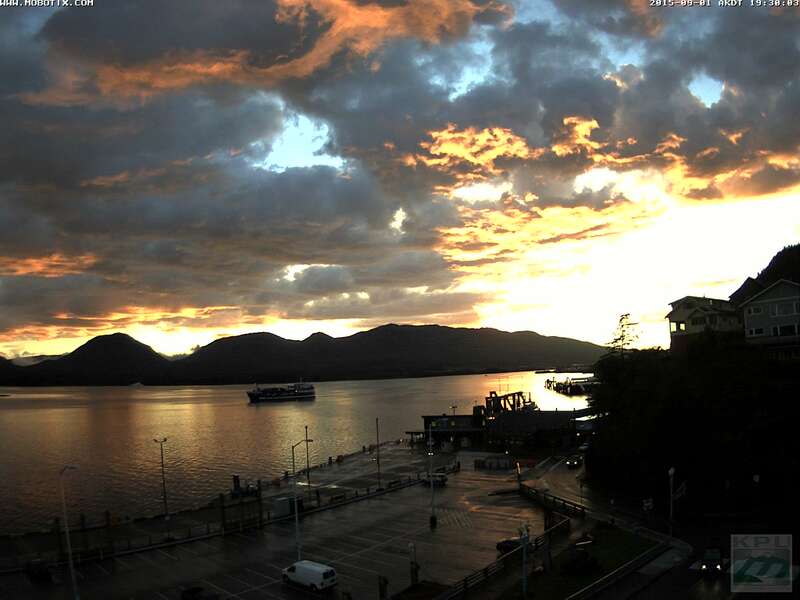 Welcome to the KPU Webcam site! Our Hi Def Webcams feature unique views of Ketchikan (Alaska’s First City). KPU Cam 1 looks east-southeast over downtown and features a view of 3 of the city’s 4 passenger-ship-berths. Up to 1,000,000 visitors arrive here every year (aboard one of the world’s best cruise ships, often pictured here, seeming to hover over our history-rich city). Click here to see an “in season” view. Welcome to the KPU Cam 2. Alaska’s First City has almost a mile of continuous pier, enabling up to four of the world’s largest cruise ships to visit simultaneously (effectively doubling the town’s population for the day!). 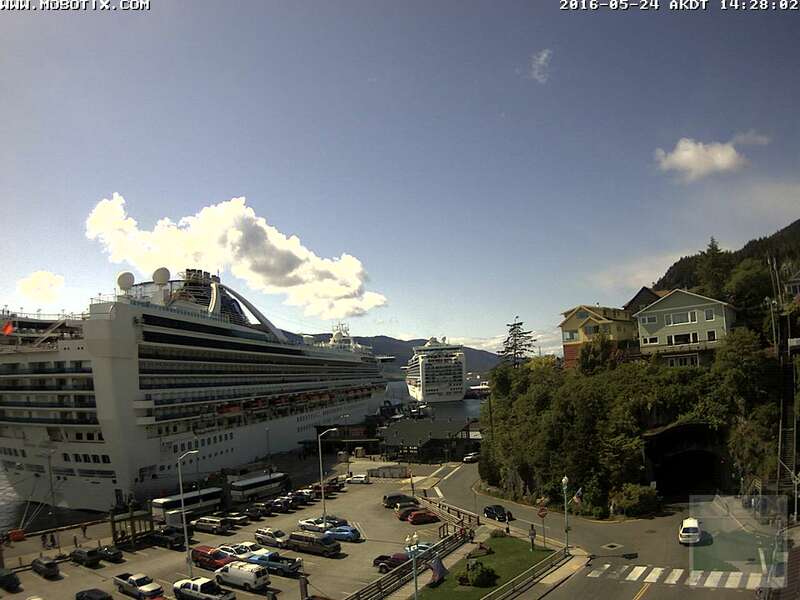 Located in downtown Ketchikan, Cam 2 looks west into Berth 3 and straight into Berth 4. Click here to see a view of Berth’s 3 and 4 “in season”. Cam 2 also provides a great view into the east side of Ketchikan’s unique one-way tunnel. Cam 2 – with it’s Westerly view – provides an excellent vantage point to capture spectacular sunsets throughout the year. Click here, here, and here for sample sunset views. KPU Cam 3 looks east toward downtown Ketchikan. Located near The Point at the end of Jefferson Way, Cam 3 features views of fishing boats, floatplanes, and cruise ships. The work of local artist Terry Pyles (see Terry’s online art gallery) is representative of the activity often picked up by Cam 3. We think these views illustrate why tens of thousands visit our town every year, taking advantage of sightseeing, charter fishing, rainforest tours, local boat tours, snorkeling, zip-lining, flight seeing, off road adventure kart tours, kayaking and other once-in-a-lifetime opportunities to experience Alaska at its very best. Click here to see a sample beautiful view from The Point. KPU Cam 4 is also located at The Point and looks West / Southwest toward Gravina Island and Ketchikan’s airport. Eagles often perch on the breakwater, and float-planes frequently glide past the camera on final approach to land in local waters. 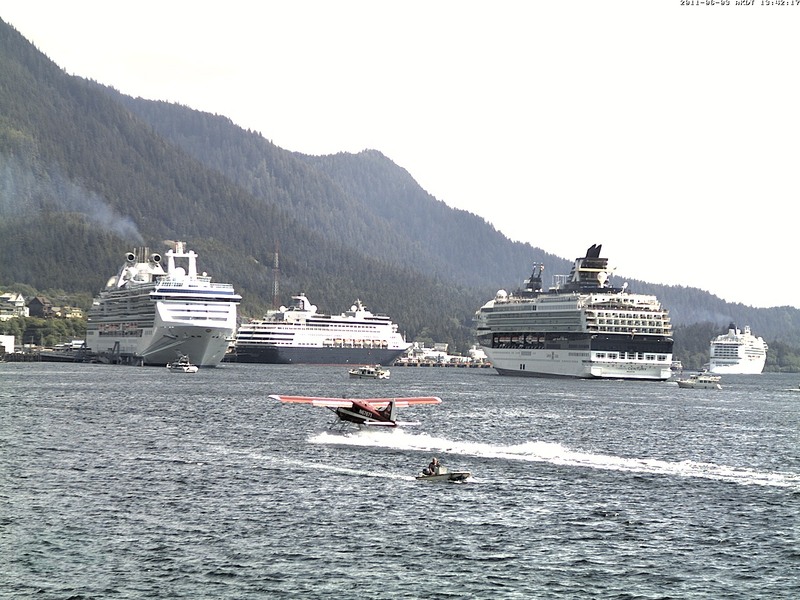 In season, Cam 4 features a parade of tour ships and Alaska Marine Highway ferries. To the West, Cam 4 also offers a glimpse of Bar Harbor and many local pleasure boats and commercial vessels transiting the area. Perched above the Taquan Air dock, Cam 5 gazes West/Southwest toward Ketchikan’s airport. 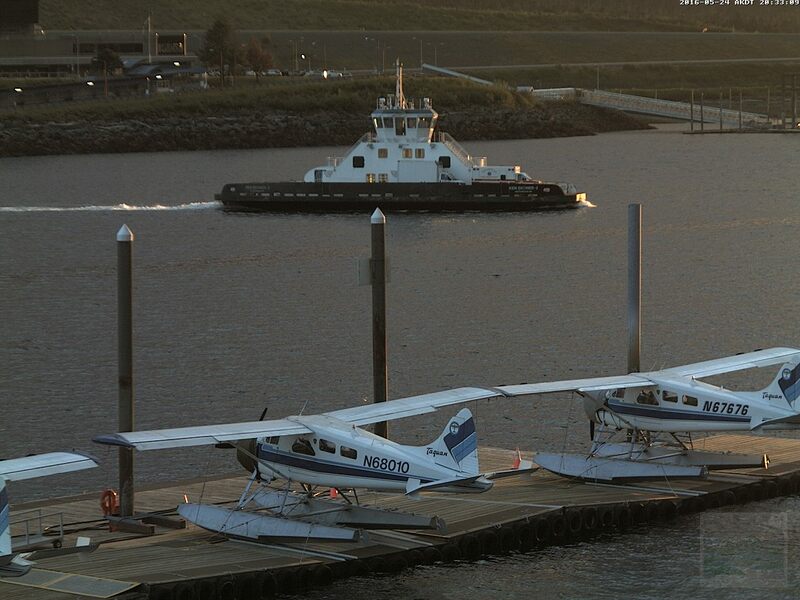 This cam offers a daily parade of planes, ferries, tour ships, barges, tugboats, fishing boats, Alaska Airlines flights and colorful Southeast Alaska sunsets. From here you can watch Taquan Air’s beautiful classic fleet of DeHavilland Beaver floatplanes load up, fly away and return throughout the day. Offering daily air service to many nearby communities, Taquan also specializes in spectacular once-in-a-lifetime sightseeing tours to Misty Fjords, flights over nearby glaciers, bush pilot tours, bear tours, and more. Click on the webcam photo for high resolution Mega and Alaska-sized views! 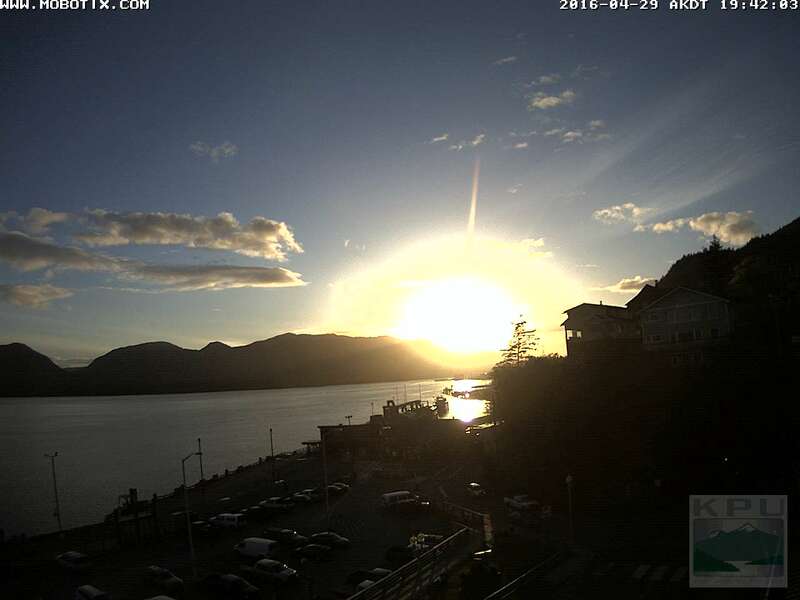 Located on Ketchikan’s Alaska Fish House downtown, Cam 6 offers a great view of 3,000′ Deer Mountain and the Thomas Basin boat harbor. 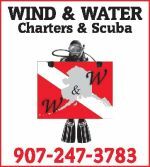 Tourism related boat charters operate throughout the summer from this area, and the Thomas Basin boat harbor is home to many local pleasure and commercial fishing vessels. Throughout the summer Cam 6 features great views of large passenger ships transiting the area, and features outstanding sunrises and sunsets. 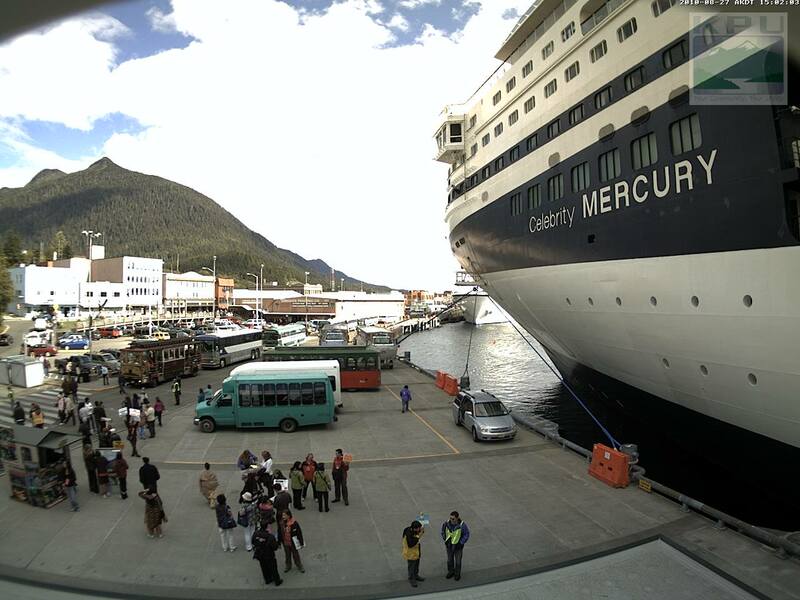 Click on the webcam photo for high resolution Mega and Alaska-sized views! Cam 7 is located on KPU’s cell-tower, high on a hillside overlooking downtown Ketchikan (we use the tower in partnership with Verizon Wireless to provide the community with Ketchikan’s very best 4G/LTE high-speed wireless service and coverage). 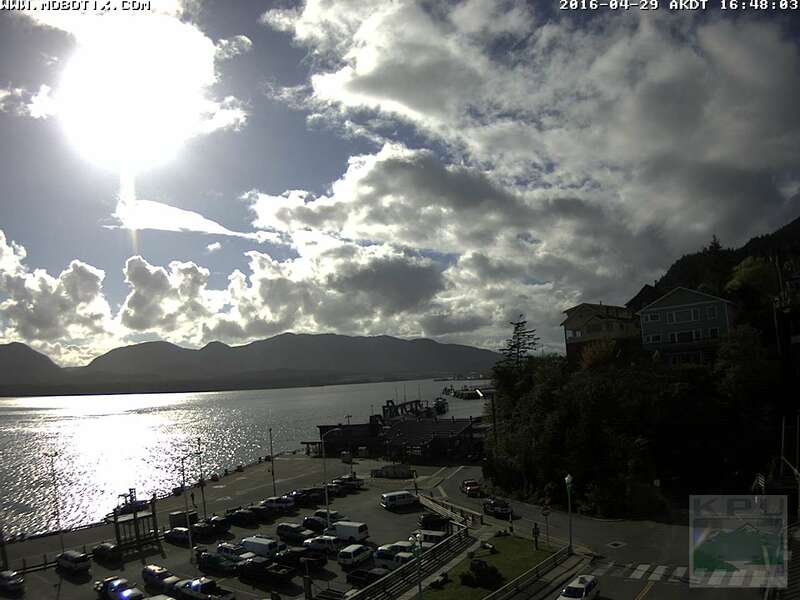 Cam 7 provides a view of downtown Ketchikan, a partial view of cruise-ship berths 1, 2, 3, and 4, with Tongass Narrows, Thomas Basin boat harbor (in the foreground) and Bar Harbor (in the background). In the far background is Ketchikan International Airport (KTN). With over 100,000 annual passenger enplanements, KTN is Alaska’s 5th largest airport. 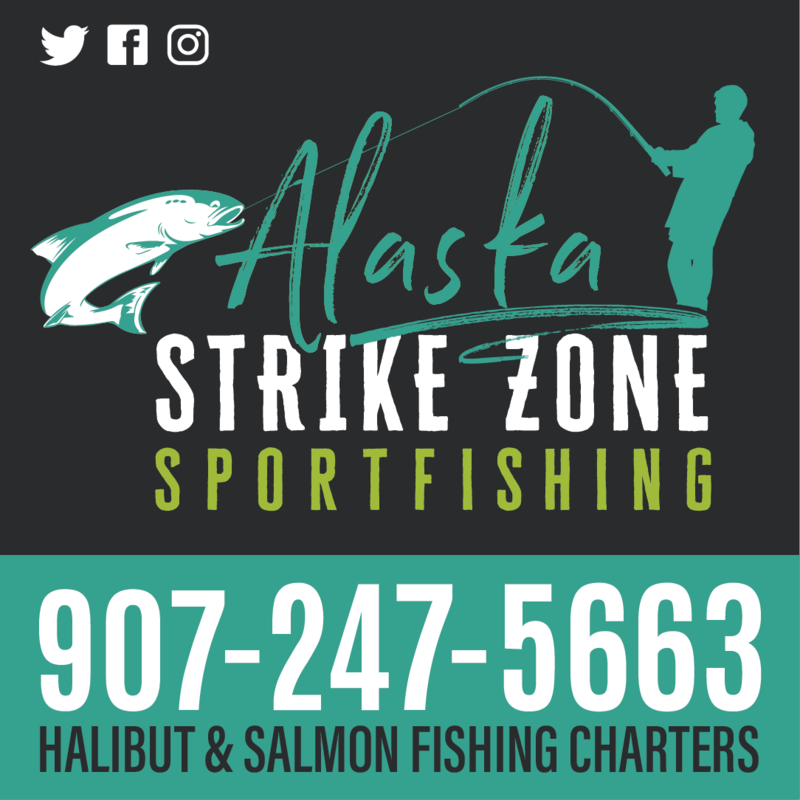 KTN is located on Gravina Island – separated from Ketchikan by Tongass Narrows – with no road or bridge connection between Gravina and ‘town’. 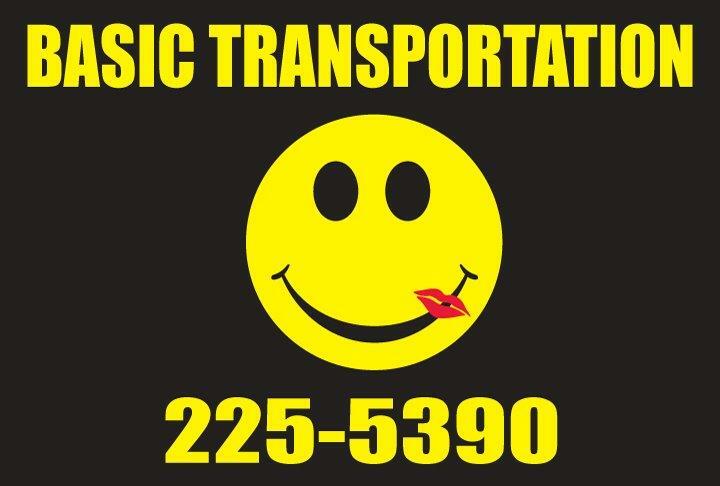 So, airline passengers arriving or departing Ketchikan must take the airport ferry. On foggy or cloudy days Cam 7 is …. well …. in the clouds! But on nice days we think you’ll agree the beautiful view speaks for itself.